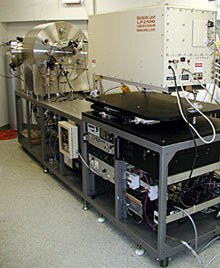 The Space Environment Simulator (SES) is a modern fully computerized experimental facility designed and created at ITL Inc. for testing, qualification, and lifetime prediction of spacecraft materials and coating in simulated conditions of the LEO space environment. The SES currently has the ability to expose materials under high vacuum to atomic oxygen (AO), vacuum ultraviolet radiation (VUV), near-ultraviolet radiation (NUV), and temperature cycling (TC) to assess their durability and study the material damage mechanisms. The photo to the right shows the general view of the SES facility and the components and their location in the facility. 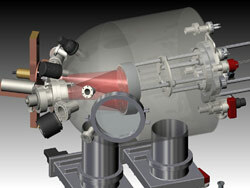 High vacuum conditions are achieved by using two mechanical pumps (DS-402, DS-602) and a Varian TV 1001 turbo pump. When the correct working pressure is obtained in the chamber, the samples could be exposed to various factors of the space environment. Generally, this involves AO irradiation of the material separately or in combination with irradiation by NUV, and/or VUV, and/or TC.